November 2016 - my name is Food. 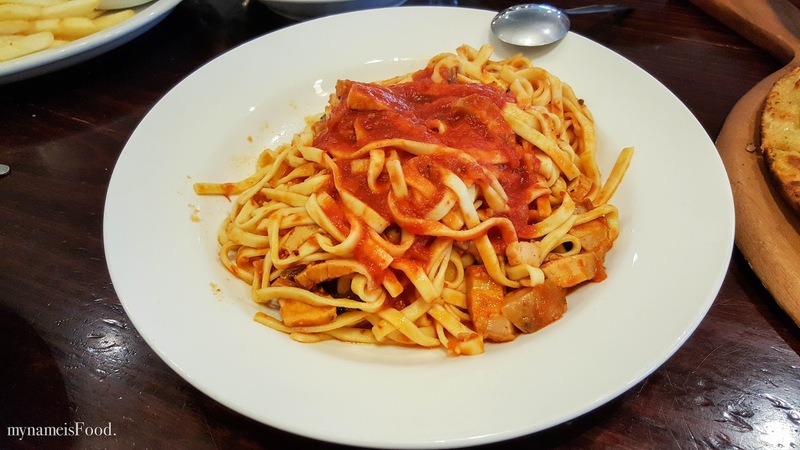 Fasta Pasta used to be a food outlet serving up good old homemade Italian dishes for family and friends to enjoy and be able to dine in on a weeknight or even on the weekends. 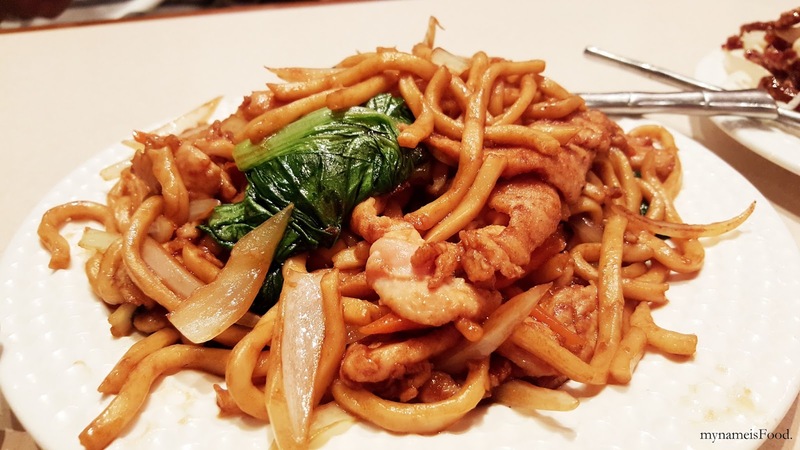 There are only a few outlets left now in Queensland and sometimes you may experience some good and bad when you dine. 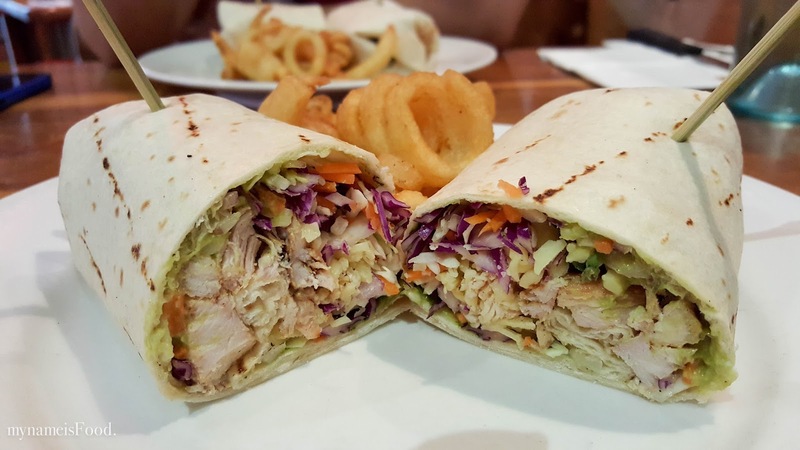 Lately, there has been a few changes which has been great along with the friendly waiters as well as the owner. 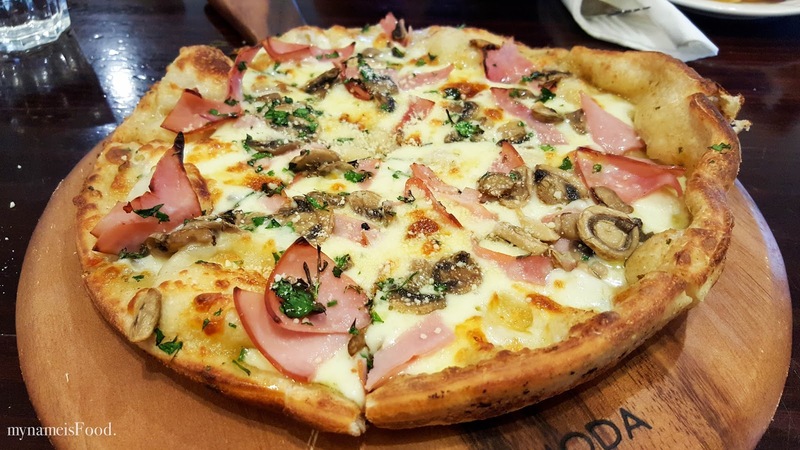 'Pizza Bianca Italiana' (AUD$7.90) was the only pizza option in their lunch menu but don't underestimate it as it will come with a fluffy base topped with toppings full of flavour that balanced each ingredient well. 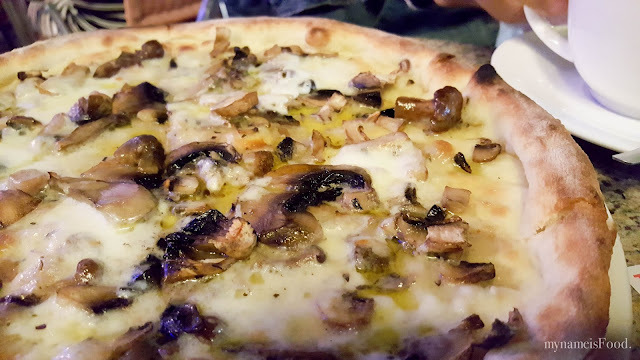 With olive oil, ham, garlic, mushroom and mozzarella cheese, you may even eat this as breakfast by the sounds of it. 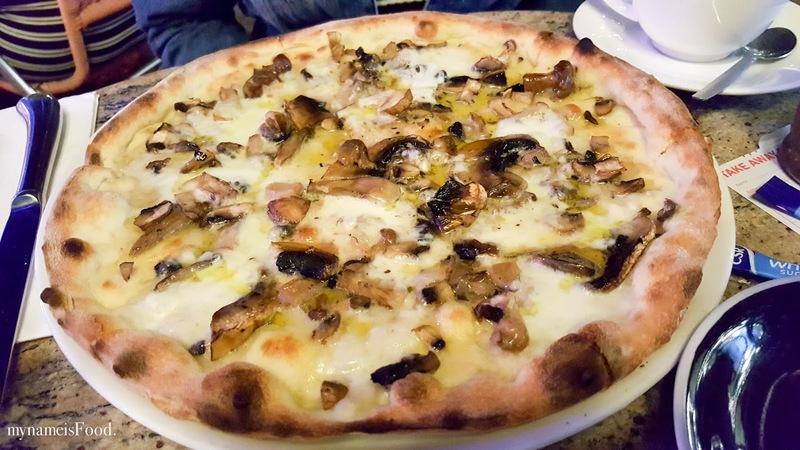 It may sound like a light dish to have and to order but having a well made medium fluffy base was the highlight of the pizza. The amount of ham and mushrooms as well as mozzarella cheese was more than what other pizza shops would give you and although the size isn't as big as takeaway pizzas, it definitely would satisfy you anyhow. 'Lasagne' (AUD$8.90) was served in a seperate oval bowl with a simple garden salad and chips served on the side. Oven baked lasagne topped with mozzarella cheese and bolognese sauce, although it wasn't anything special, it was just alright. The lasagne did not fill the whole bowl so imagine having it 3/4 of the way. 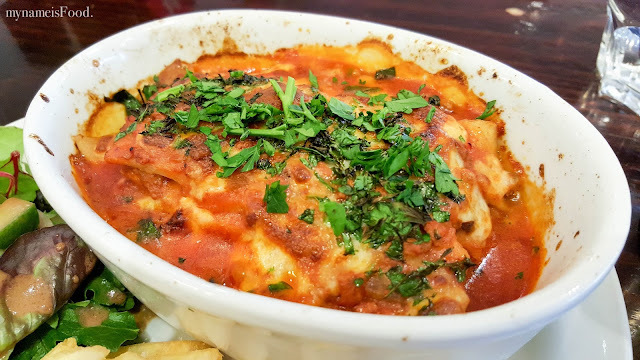 Though with the downs, the lasagne had numerous layers and tasted homemade and not supermarket bought which was quite nice to know. 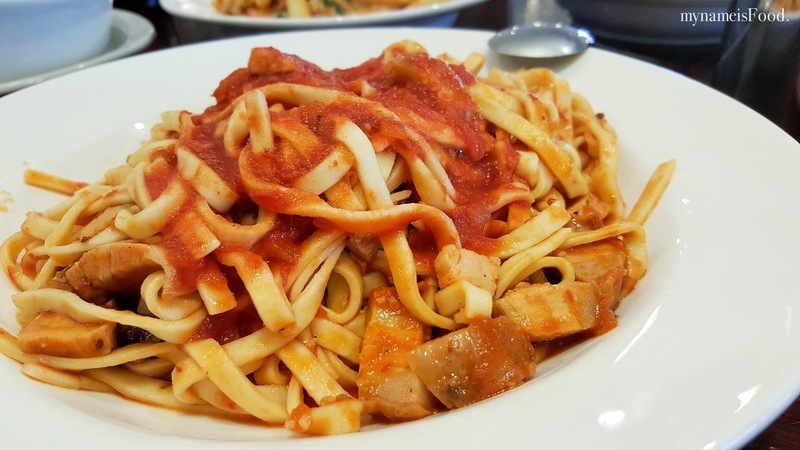 'Linguine Amatriciana' (Entree: AUD$15.90, Large: AUD$17.90) was slow roasted pork belly, napoli, white wine, garlic, chilli and basil served with Linguine pasta. 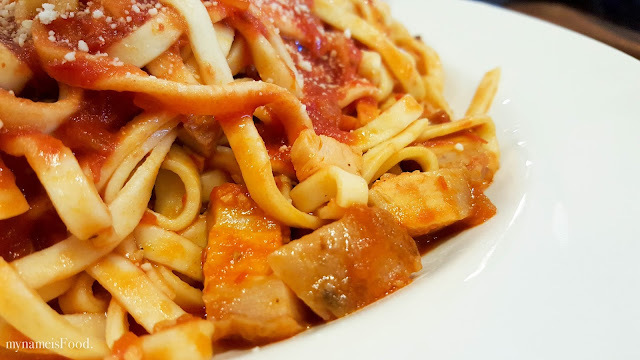 For an entree sized pasta, their portion has always been great and more than enough to fill you up where you end up thinking that the larger size isn't needed. 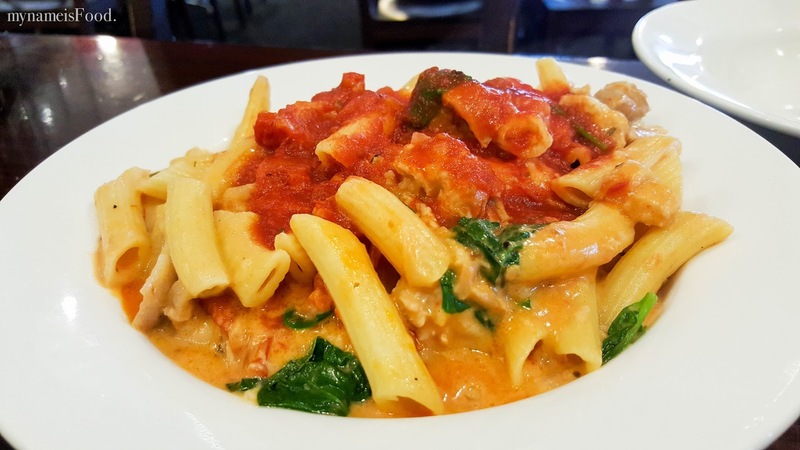 When ordering the entree size, you are able to share it with others on a side plate. Although I wasn't able to taste the basil, you can taste the white wine and the napoli sauce as well as the hint of the heat from the chilli. The slow roasted pork belly was thinly sliced and although it isn't something that someone would use to cook pasta with, it is quite a unique combination that works well. The amount of roasted pork belly was quite sufficient, just remember to mix the pasta to even out the sauce. 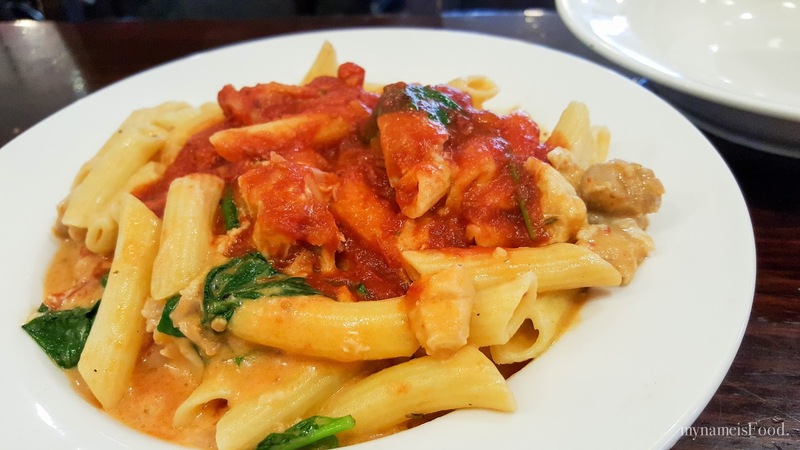 'Penne Rosso' (AUD$8.90) was one of the dishes in the lunch menu options. Chicken pieces cooked with semi dried tomatoes, baby spinach with tomato and cream. 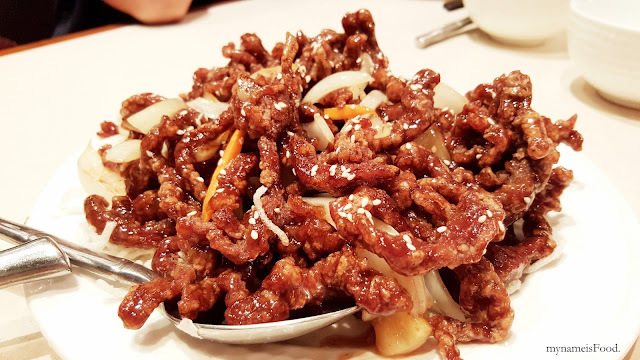 Similar to the previous dish, its portion was quite enormous. 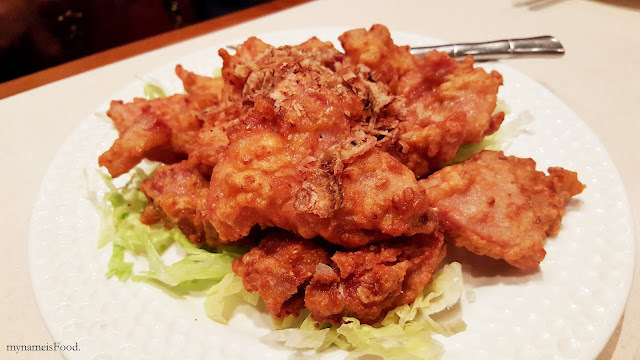 The balance of the tomato and cream was nicely balanced, not too salty and the chicken pieces were heaps in terms of big chunks of chicken thigh pieces, juicy and succulent. The baby spinach was the only greens in the dish and although it would have been great if there were more, it was not too bad overall. Movie World is always a fun place to go with family and friends, and with all the rides and all the entertainment you get makes you sometimes forget about eating. 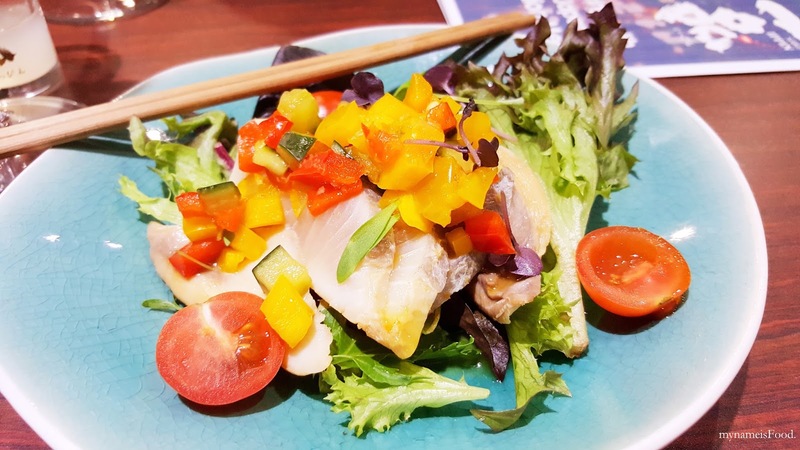 There are about 13 different cafes, restaurants, snacks eateries where you can have a sit down and dine or just simply takeaway food. 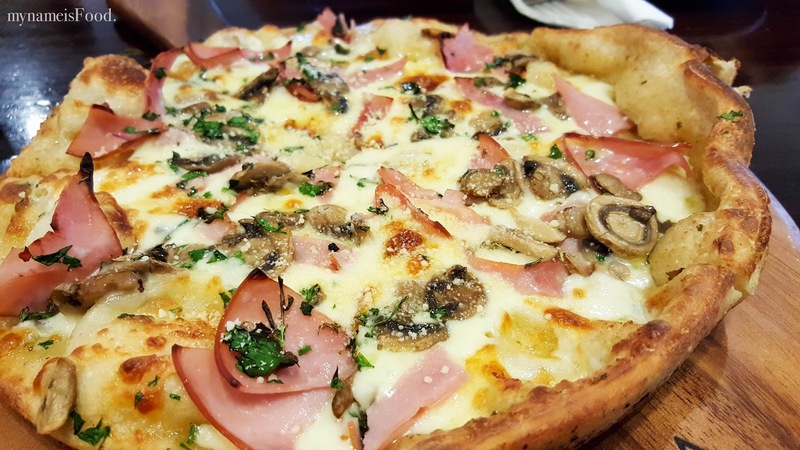 Whether it may be fresh artisan bread filled with smoked pastrami or having a brain freeze from Ben and Jerry's, you can find something that will make you hungry. As we were walking through looking for food to eat after finishing watching the must-watch Hollywood Stunt Driver 2 show, we found ourself at Gotham City, the home of Batman. 'The Double Beef Burger' (AUD$14.90) was their Signature burger, hence, why we decided to order it. It had a double beef patty, double cheese, lettuce, tomato, onion and their special sauce served with chips. Presented in a cardboard rectangular plate with a red and white checkered paper at the bottom. The chips was nicely fried although it seemed they used too much chicken salt or just the oil making the chips looking very yellow indeed. The burger was wrapped with a thin paper which was great as it separated the burger from the chips on the plate. The burger itself was surprisingly not too bad although it did lack a few things such as flavour in the sauce as it just tasted BBQ-ish. As for the beef patty, one was quite thick but the other was quite thin, not sure if it is usually like that or just the way they do it. 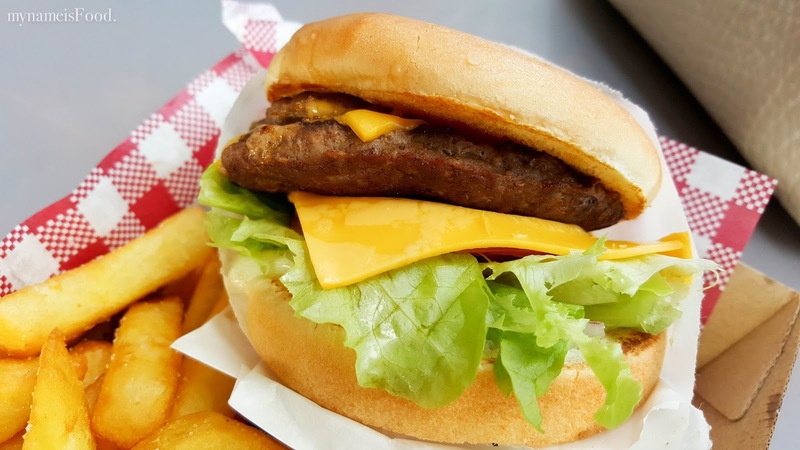 A simple burger but fills you up quite well, worth a try if you're looking for a quick lunch to grab. 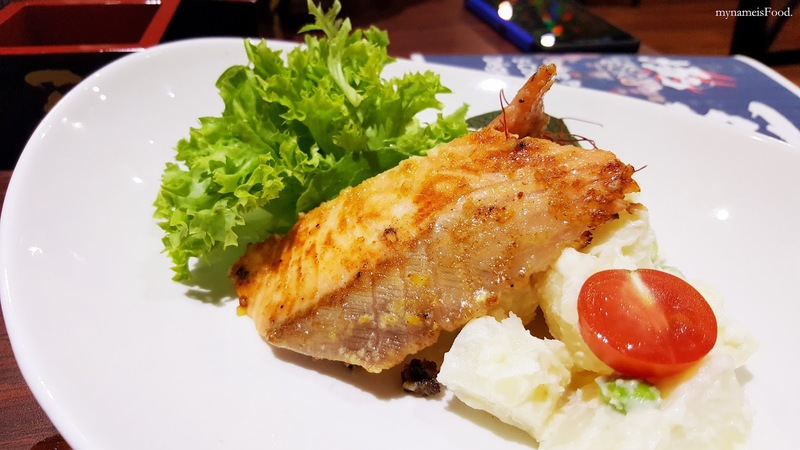 Sometimes when eating at a restaurant with different branches here and there, although the menu may be the same but the portion and quality may differ which usually may disappoint diners. We decided to grab a quick lunch at Hog's breath mainly because we were wanting their curly fries but sadly their lunch specials somehow decreased in size and the curly fries seemed liked the leftover bits and pieces instead of big chunks as the usual. 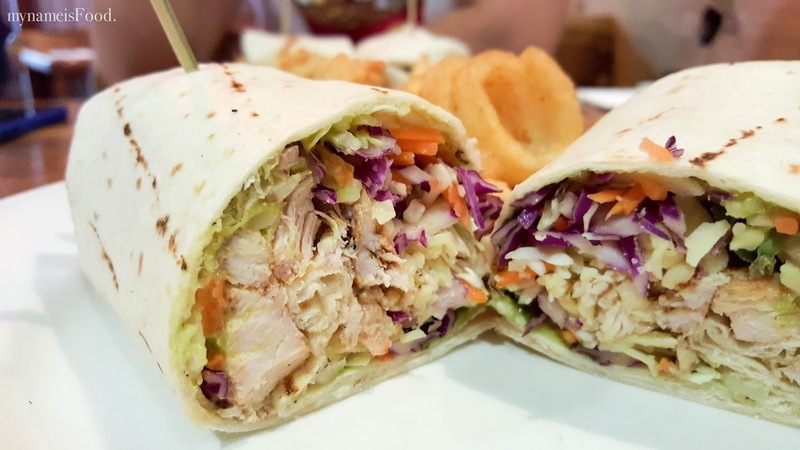 Grilled chicken, guacamole, pesto and raw slaw is chicken base wrap with the freshness of the slaw giving it that extra crunch. 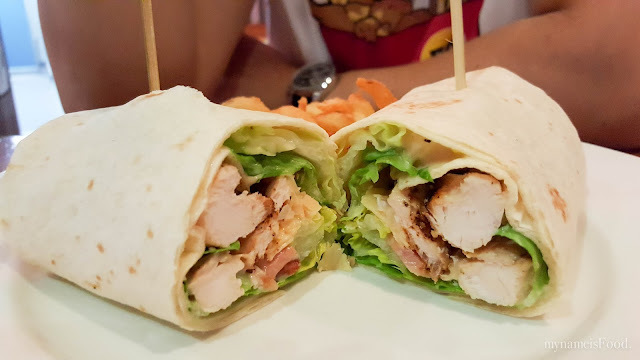 However, you could hardly taste the pesto in the wrap with every bite you take. 'Crispy Chicken Caesar Wrap' (AUD$9.90) is always a great choice to order when unsure of what to eat. 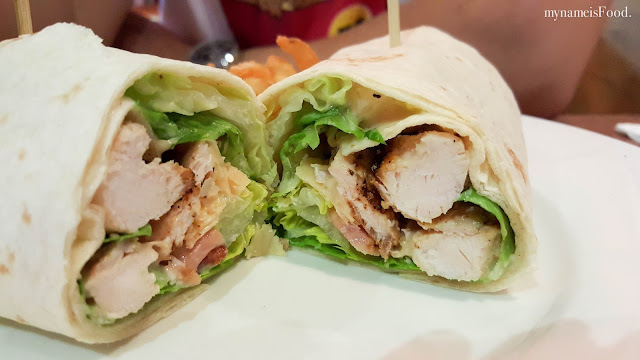 Imagine caesar salad with all the bits and pieces of the goodness of croutons, cos lettuce, caesar dressing, bacon and of course, grilled chicken breast all in a wrap. Still remembering back in the days when there was a humble pancake shop near the Formosa Asian market where I would order their hotcakes or danish fingers and nibble on them. 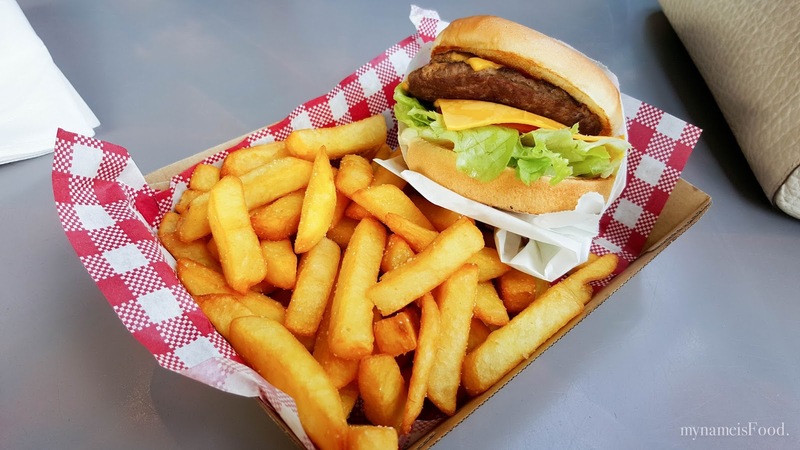 They have now moved to a new spot in the plaza to a newer and refurbished stall with a bright red coloured sign as well as an open kitchen where you are able to watch them make your order. 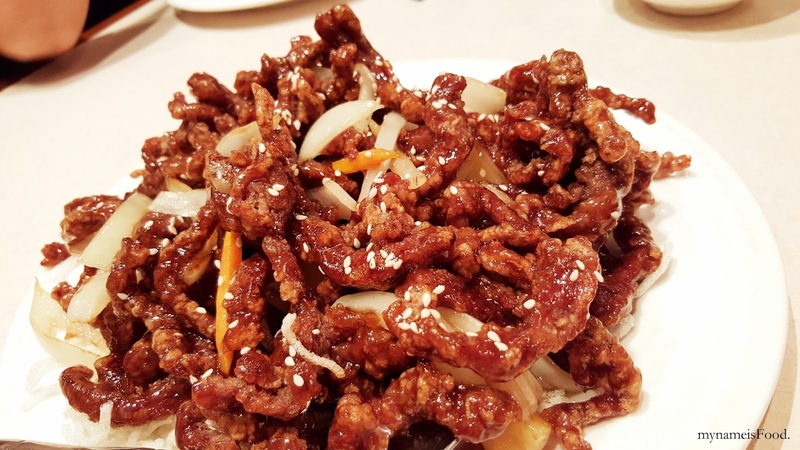 It wasn't long after their opening when we spotted the new place and decided to order some on the way home. Although there was a line, we thought that it wouldn't be too long as others were getting their orders not long after ordering and the line was served quite quickly. After waiting in line for awhile, we finally got to the front and ordered both their pancakes and croissant fingers. We were told it would take about 10mins as they were still making them, so we waited. 10mins later.. 15mins later, we asked if our order is ready as some of the others that ordered after us were getting theirs before us. 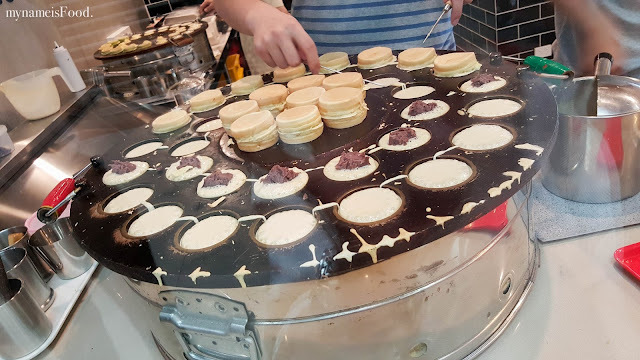 We were told that they were ordering the ones that was ready or had just finished, also whilst we were asking, the person in the counter was packing our Croissant fingers and told us that it was ready but not the pancakes. So we stood back to where we were waiting for our order as we stared at our Croissant fingers packed in a brown bag just sitting there, soon to be cold. 15mins later so 30mins in total, our order was not ready yet. Another question asked to the girl at the counter and she told us the same reason, that the hotcakes were not ready yet but very soon, only the croissant fingers were ready. I mentioned that many other people that ordered after us had already received their orders except us. Then she mentioned that one of the flavours that we ordered were not ready yet as they were making all the other flavours on the menu but the flavour we ordered although popular too was not ready to be put in the hotcake pan. I then said that we could've been told so that maybe we could change the flavour instead of having to wait for a long time. She kept saying that it would be ready soon and for us to wait a few minutes.. 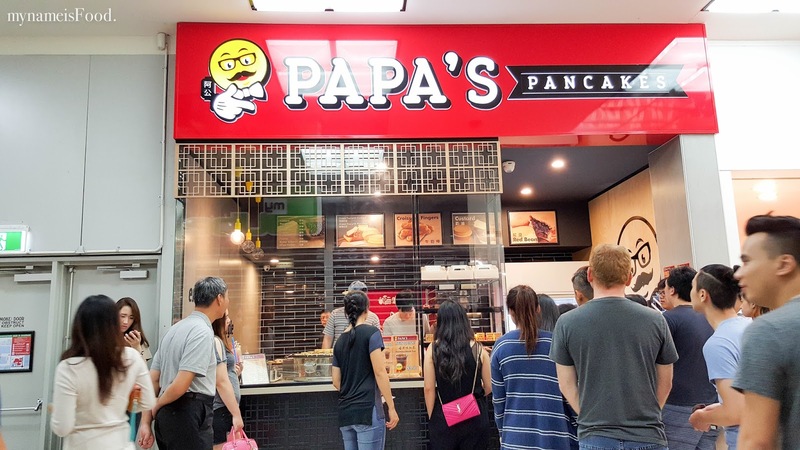 I told them that if the order isn't ready soon, I would rather cancel it than having to wait around for more than half an hour just for hotcakes and that I could just come again another time to buy them. Another 5-10mins later, our number order was finally called and we received our order but sadly the croissant fingers weren't as hot as they should be as they have been just sitting there on the table waiting. Not a great experience to start with our first order from their new and refurbished venue.. Ordering their 'Green Tea w Red Bean', 'Coconut' and 'Custard' (AUD$1 each), not wanting to order our usual flavours turned out to be more of a hassle and a stressing time instead of being happy and excited to nibble on them. Nevertheless, we brought it home and ate it straightaway before it turns cold. The coconut was not too bad but wouldn't be my favourite. 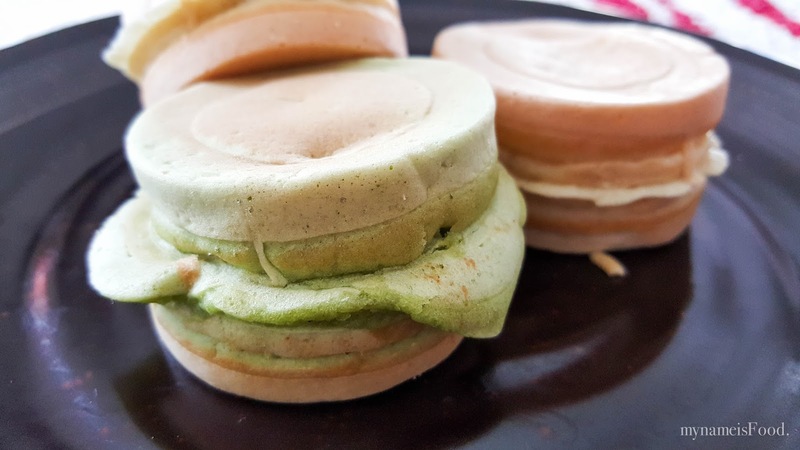 The Green tea with red bean has another option of it being with custard but I did feel that the red bean was the better pick. It was all fluffy on the inside, perfectly shaped and made on the outside. 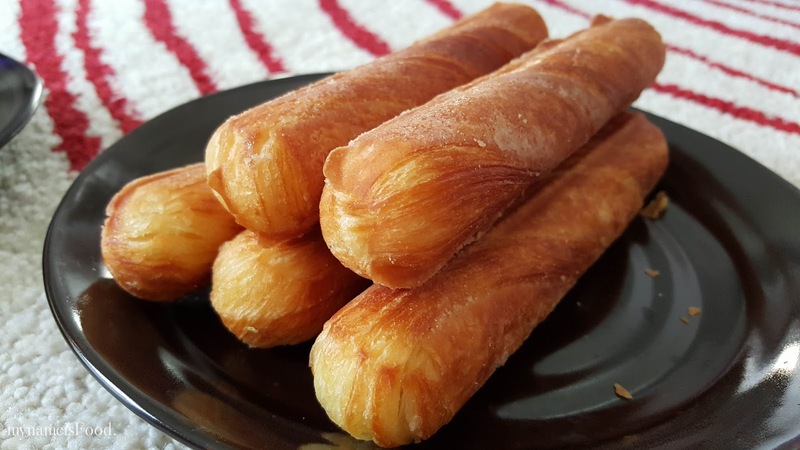 I would recommend buying the cheese or chocolate, the peanut or the taro but of course, the others are equally as delicious..
'Croissant Fingers' (AUD$1.50 each or buy 4 and get 1 free) were crispy and flaky on the outside and fluffy inside. These danish or croissant fingers you may call them are always great if you're not a big fan of the hotcakes. Be careful though as they can be quite hot once you bite into them. If customer service and estimates of time to when we were getting our orders were said to be at an adequate time, it would have been much better for both of us. I have never had any trouble before they moved to the new place and I hope to not have the same experience when I come back here again. If I do, I might just simply go elsewhere to buy hotcakes even if they have been my favourite since as long as I know it..
What you may wonder is what an Eiffel tower is doing in an Italian restaurant... This restaurant has been an icon in Brisbane and has been always one of the best places to go to for tourists as well as visitors and the locals of course. The one place where you can dine delicious Italian food then continue to coffee and dessert without having to move restaurants. The place where even if you come here for late night coffee, they won't kick you out or purposely start packing up the chairs and so on making you feel uncomfortable to even stay back a bit longer..
'Hot Chocolate' (AUD$3.95) was served in a small glass tumbler and although their Italian Hot Chocolate maybe the best here, this was not too bad. We wanted something light but filling at the same time as we weren't too hungry so we decided to order 'Funghi' (AUD$24) as we browsed through the menu. 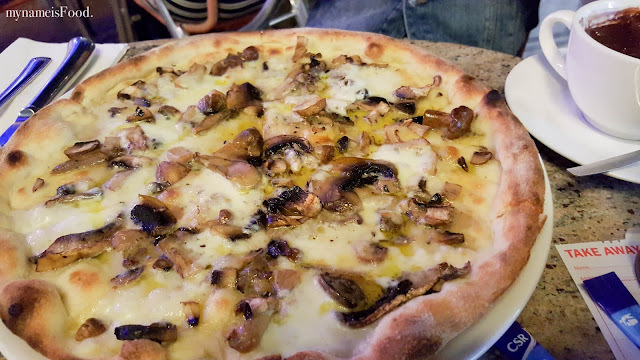 The pizza had a buffalo mozzarella base topped with mixed wild mushrooms, truffle oil and thyme. Perfect also for Vegetarians. Sometimes having a tomato sauce or a bbq sauce based pizza may be delicious but when you're wanting something different, do go for the white base pizza as it allows that creamy-ness and texture of the toppings to pop out more not overpowered by the base sauce of the pizza. 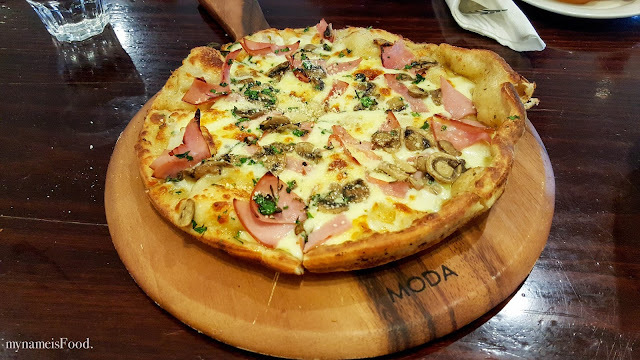 What I enjoyed was their pizza base, not too thick and not too thin yet still has that fluffy texture when you bite into it. It would have been great if there were more mixed wild mushrooms on top as it felt as if only some were cut thickly and the rest were just leftovers or bits and pieces of mushroom stalk. 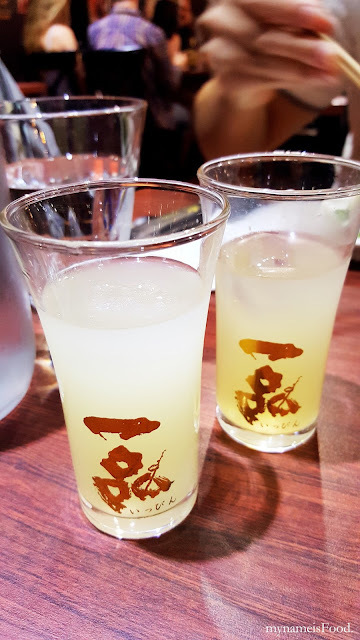 The word 'Izakaya' literally means a type of Japanese establishment, a Japanese tavern, usually found scattered everywhere in Japan even near train or subway stations. 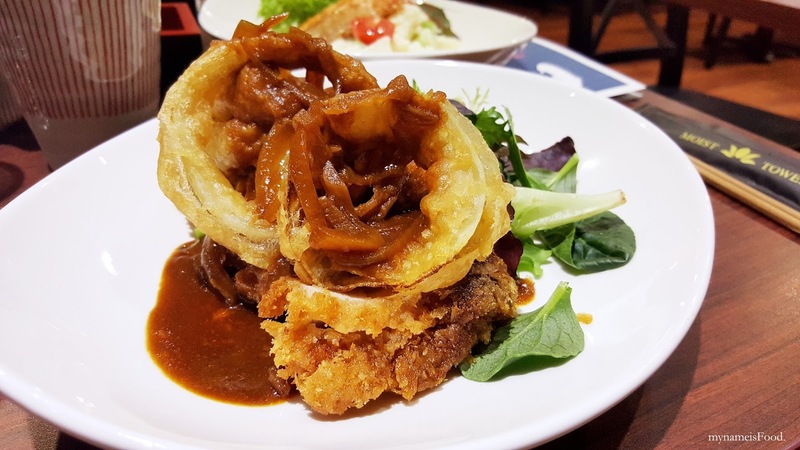 Basically, some may call it the Pubs of Japan where you can have comfort food and have drink on the other hand. 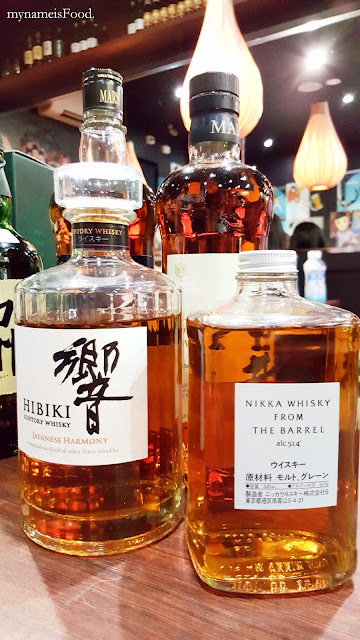 Being a compound word, the word itself has its combination of two meanings of stay and sake shop which is a quite a unique way of interpreting and putting a name into a certain something, especially one now that Japanese Izakaya are starting to open worldwide. 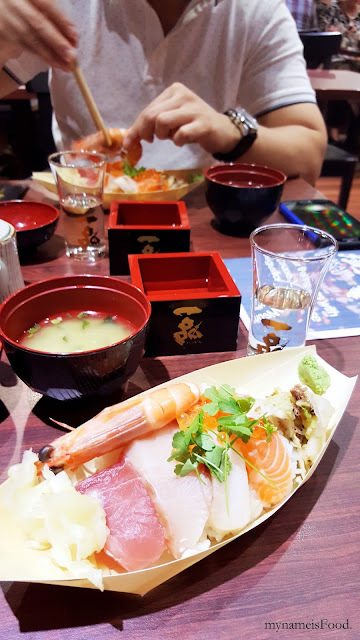 Located on Boundary St, a small establishment with limited dining space but as soon as you enter, you may find yourself being in the middle of Japanese art and backdrop making you feel as if you weren't in Brisbane so much. Izakaya Goku has opened its doors collaborating with Ippin Sake as well as Huon Tasmania for this very special night of Degustation consisting of 5 courses with Sake pairings. 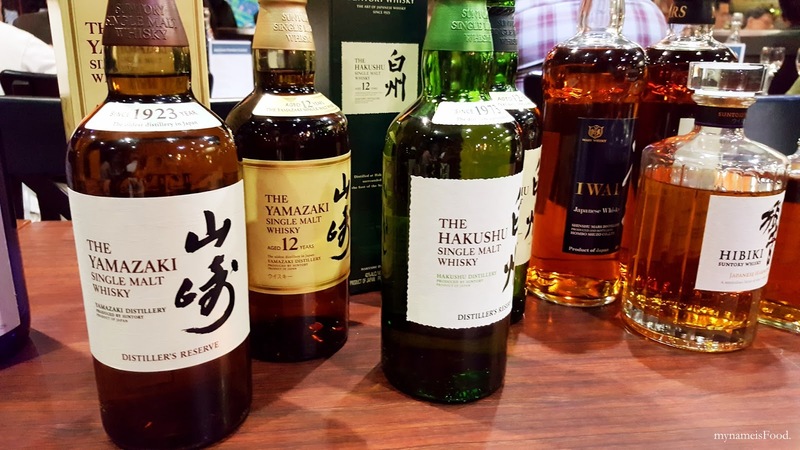 Various types of Japanese Sake and Whisky. 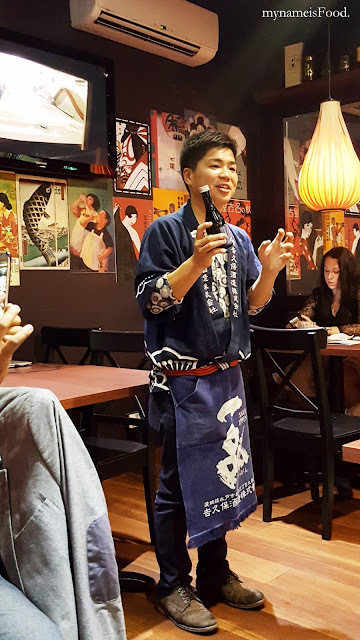 A sommelier from Ippin Sake also attended the event and talked about the history and culture of Sake. Satoshi Yoshikubo, is one of the grandsons of the Yoshikubo family who owns the Yoshikubo brewery in Japan which has been brewing sake for more than 200 years. 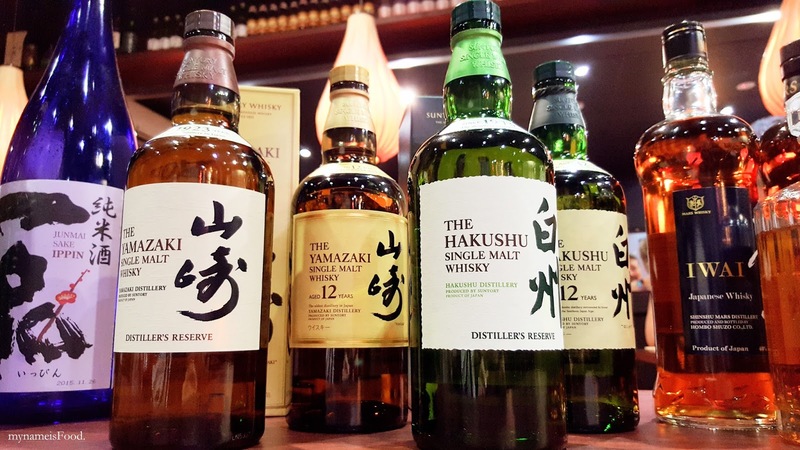 A family business that has been passed down from generation to generation. He is now currently residing in Australia continuously promoting Ippin Sake and their historic sake. Their brewery has exports sake all over the world and is still growing strong. 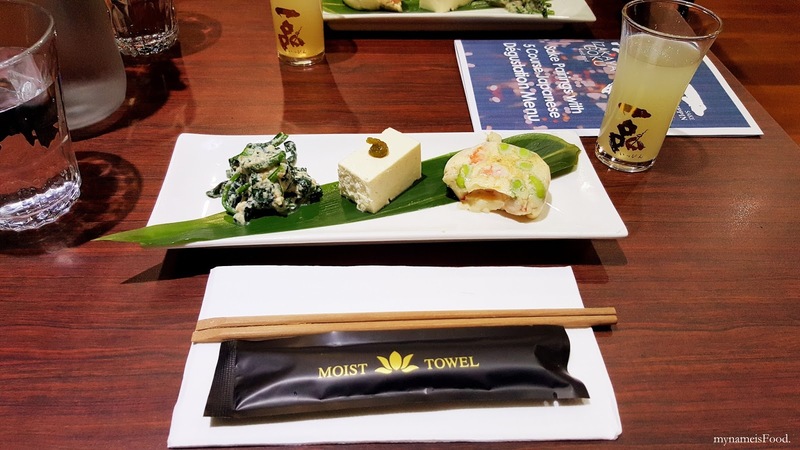 Starting off the Degustation night with an 'Assorted Tofu Plate' accompanied with Ippin Japanese Limoncello. 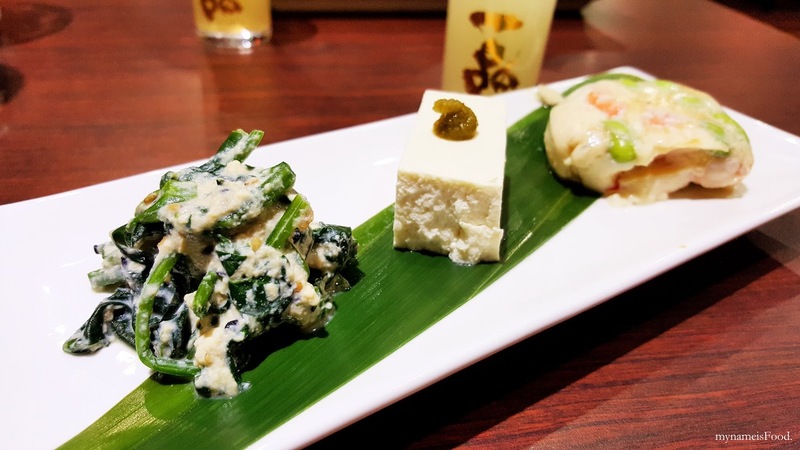 There were three main different kinds of tofu served, the Prawn and Edamame Egg Tofu, Spinach Tofu (Shiraae) and Cream Cheese Tofu. 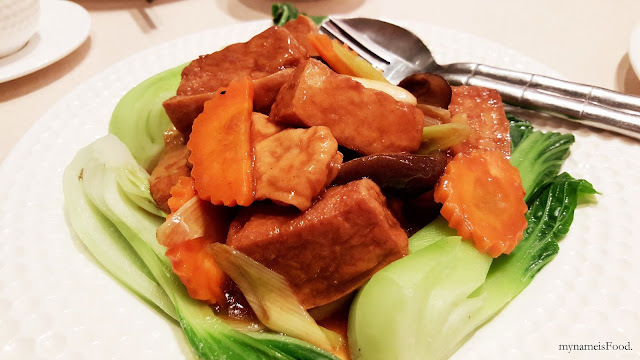 These Tofu isn't your typical kind, the ones where you can just buy off the Supermarkets or even when dining at a Japanese restaurant and you would order their Agedashi Tofu and such. 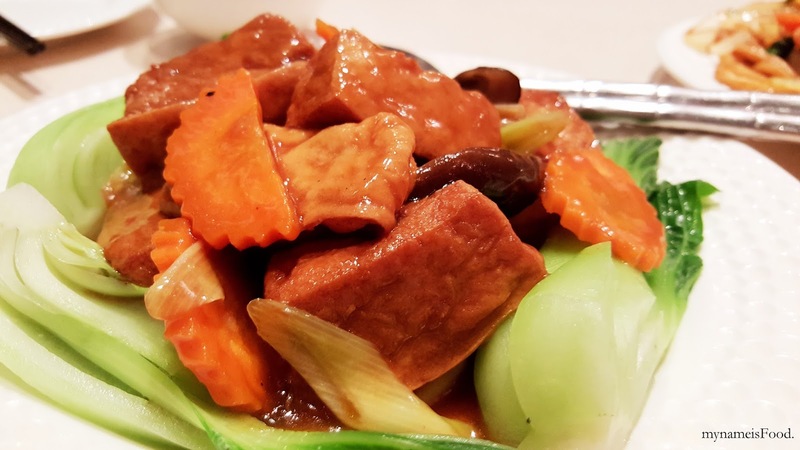 Instead, they have created a unique way of presenting Tofu using different elements in which others may not have thought of before, just yet. 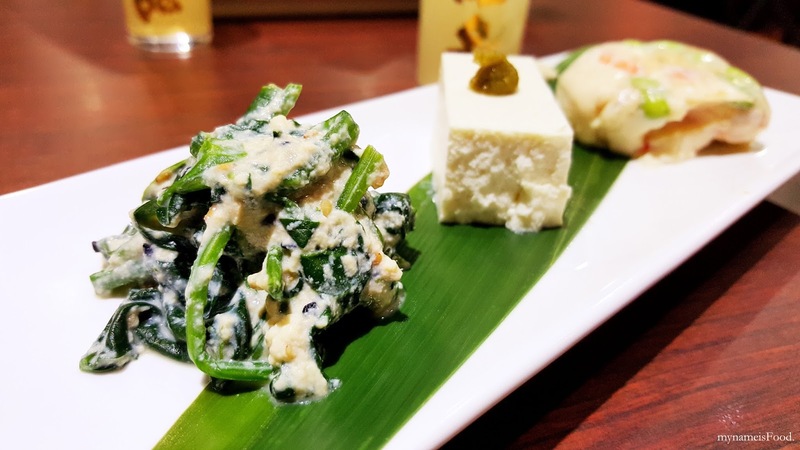 Spinach Tofu isn't something I would have thought of however the texture of the slightly wilted spinach and the grounded tofu worked quite well together. 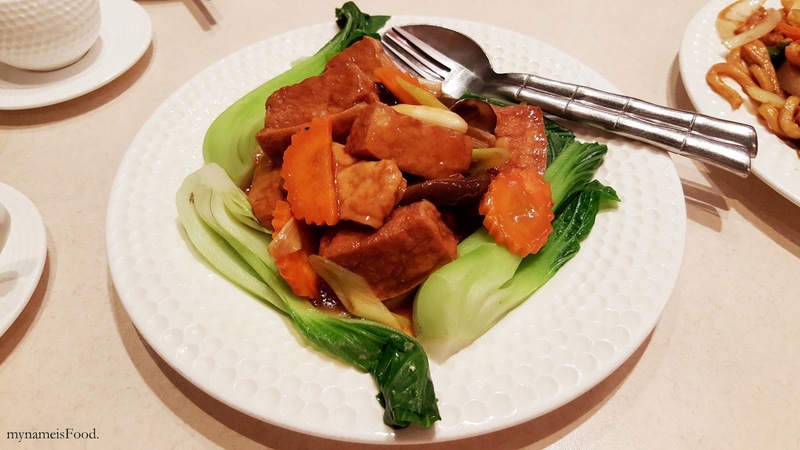 There was also a bit of a grainy texture within the tofu. 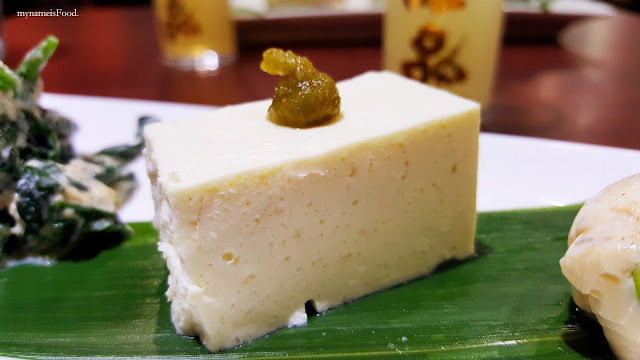 The Cream Cheese Tofu was rather interesting at first not being able to see how it might work. However, when you do give it a try, you are able to taste the strong hint of cream cheese but yet there is also that soy milk residue. It's interesting how the Tofu can be blended in with the cream cheese but yet it doesn't overpower but instead blends in and soaks up the cheesy flavour. It isn't as smooth as cream cheese though it does depend on what kind of Tofu was used to create this. 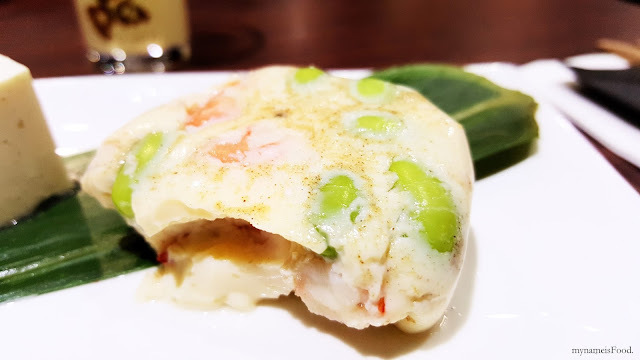 This Prawn and Edamame Egg Tofu was such a delight and the green and light pink colours of the Edamame beans and Prawn simply pops out of the Egg Tofu and made itself being a very petite yet pretty dish. 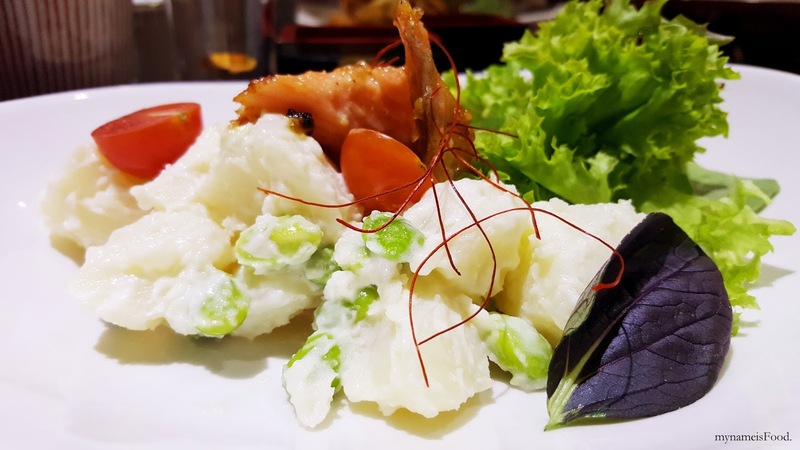 It was great to see that there was big chunks of prawns as well as whole Edamame beans mixed into the Egg Tofu. 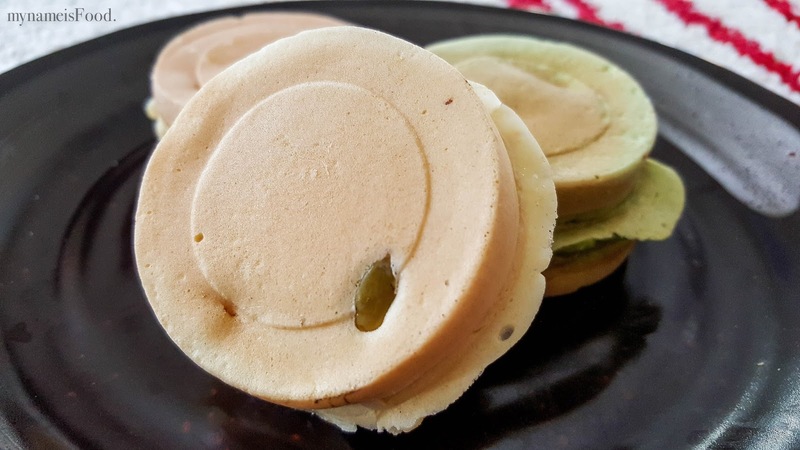 This was such a delight to eat that it makes you forget you're eating Tofu as it didn't really have that strong Tofu texture nor flavour but instead it reminded me of a boiled egg white with Edamame and Prawns in it. The second dish was a 'Cured Kingfish Salad' paired with a chilled Ippin Junmai Daiginjo Sake. 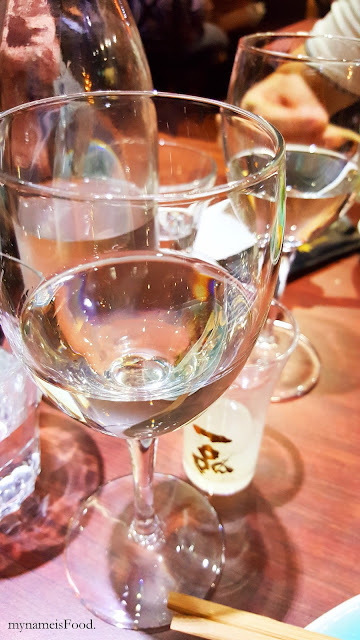 A sip of the Daiginjo will allow you to taste the fruitiness of the sake though tempered by the savoury yet having the right amount of acidity. 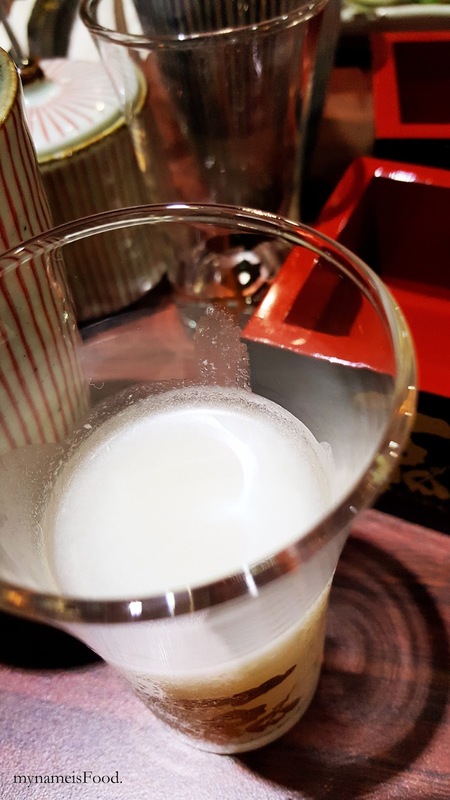 The fruity flavour seemed to be a Pineapple aroma and an interesting fact is that this sake was kept under 3 degrees to be this way. At first I wondered why they had decided to serve a chilled sake but after devouring down the second dish, I realised that it matched each other perfectly and allowed us to have a refresher from the first dish which was filled with various types of Tofu. The salad was fresh with Yuzu pepper salsa of cubes of capsicum, cucumber with cherry tomatoes and fresh salad greens. 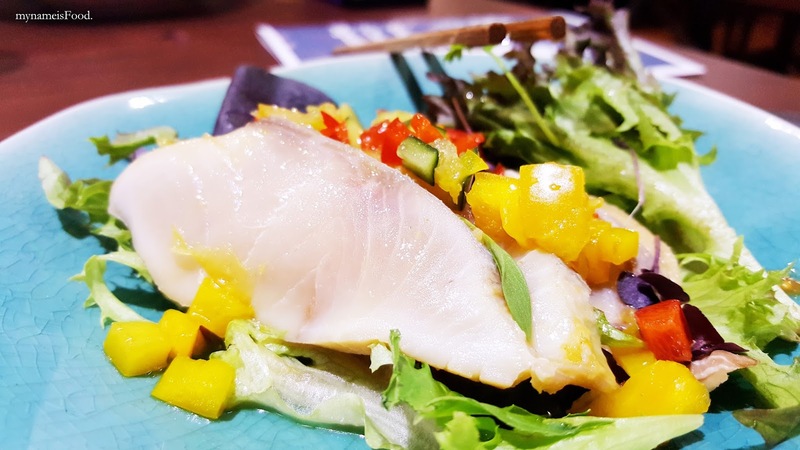 The cured Kingfish was thickly sliced, preserved well and the freshness of the fish allowed the whole dish to be enhanced. The highlight of the salad was definitely the cured Kingfish complemented with the Yuzu pepper salsa giving it a punch of tangyness. 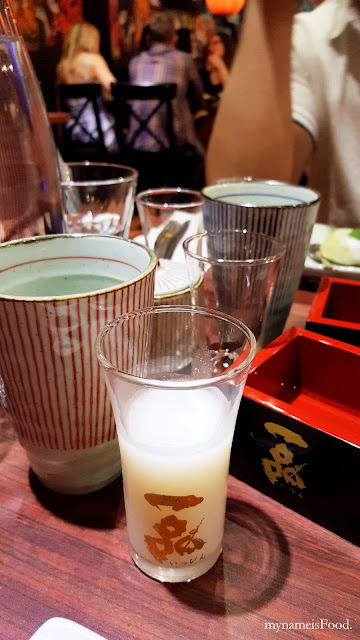 For the third dish, we were served with two different kinds of Sake, first, the Ippin Chokara, was a super dry and super smooth sake. I was actually quite surprised at how smooth it was as I was not expecting it at first glance. It was also slightly less sweet than the usual sake you would drink. 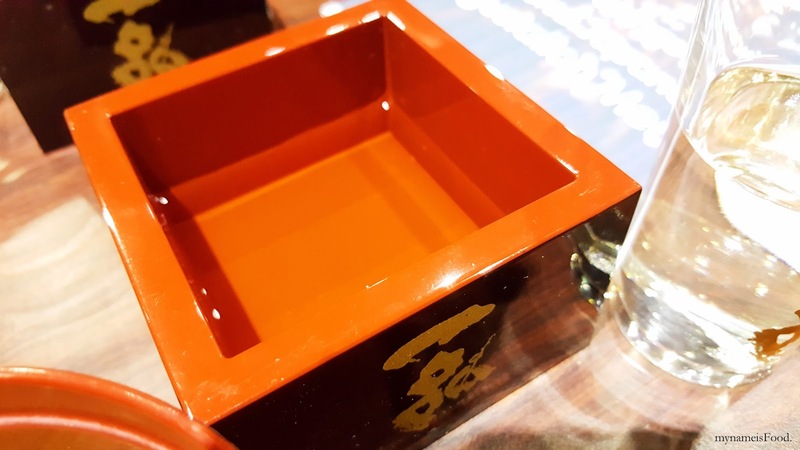 Second, Ippin Junmai served cold in the masu (square box) which is traditionally used for drinking sake at ceremonies but a funny fact is that it has also been used in the past as a measuring tool for rice and/or sake. 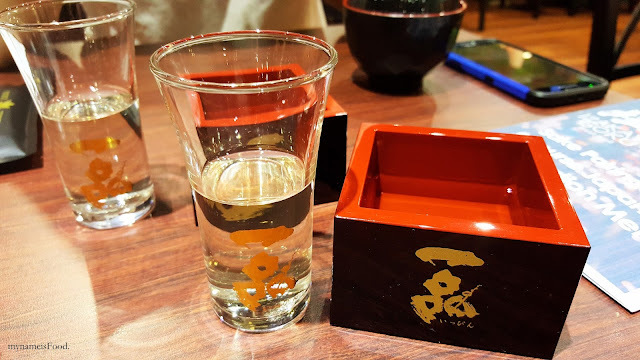 Knowing that this was a traditional way of drinking sake allows you to not only enjoy the food and the sake itself but also you gain more knowledge while at it. Ippin Junmai is a very dry but clean sake. 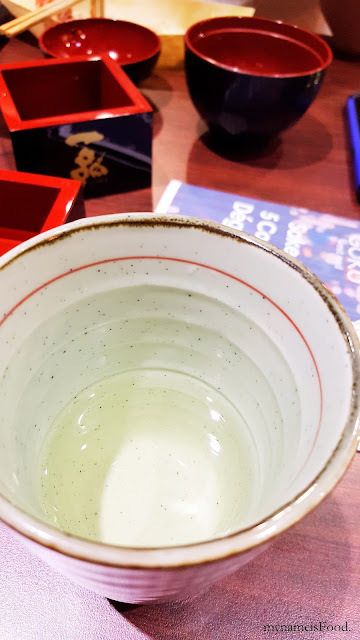 It has a fragrance reminding me of freshly cooked rice in a way but when you do have a sip from one of the corners of the masu, you are able to taste that hint of sweetness but yet the acidic citrus after taste is also present. 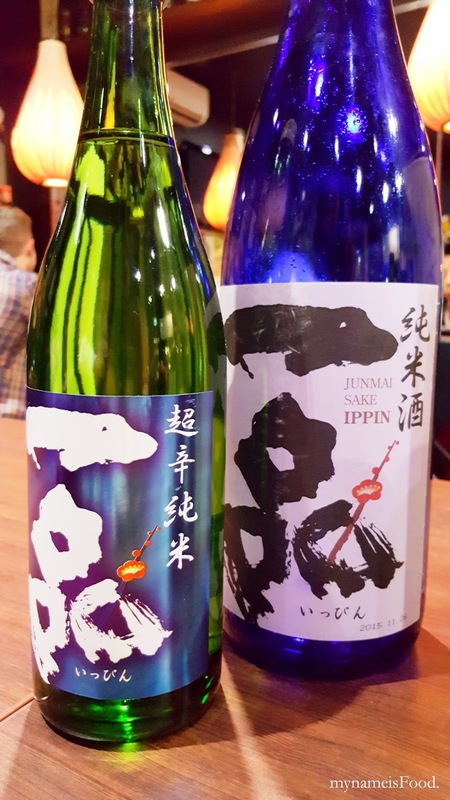 The Ippin Junmai has a medium standard and also smooth at the tip of the tongue. 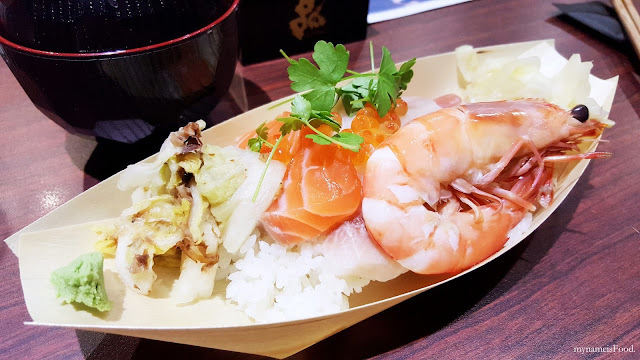 'Assorted Sashimi Bowl' was served in a bamboo leaf plate with Miso Soup and homemade pickles on the side. I did feel that they had to squish in quite a lot in this plate and maybe the plate was just a tad too small for the dish itself. 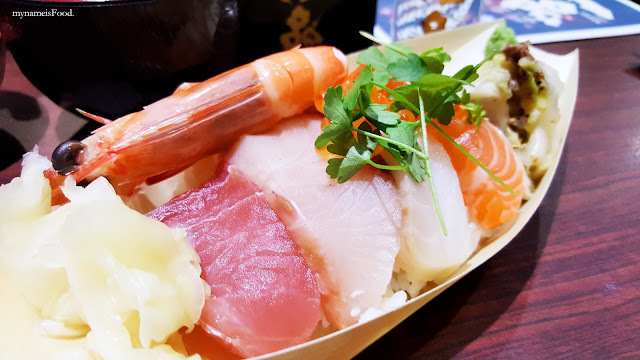 There were assorted sashimi placed elegantly on top of a bed of rice which had a variety ranging from Tuna, Kingfish, Salmon, Prawn and so on. One thing that did bother me was that the prawn head and the prawn skin was still fully attached. 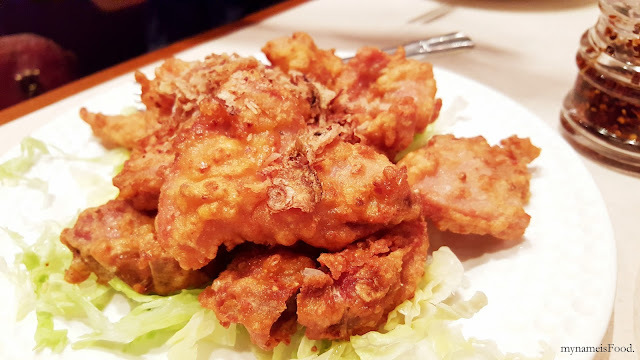 Although I don't mind using my bare hands to open up prawns when eating seafood, but sometimes during these kind of events or when eating in restaurants, I do feel as if that maybe they could've peeled off either the prawn skin and left the prawn head there or maybe the other way around instead. Not the full prawn all attached, though it does make the dish look photogenic. 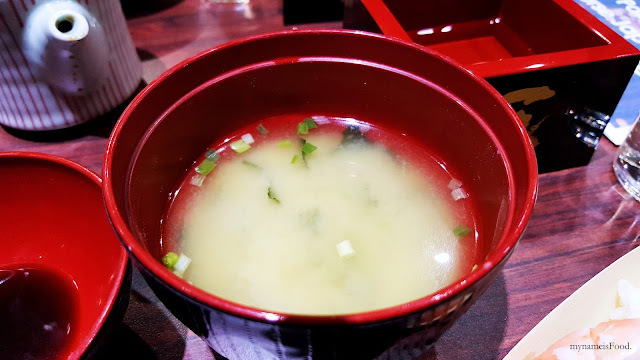 The next sake paired for the main courses was the same as previously served in a masu, the Ippin Junmai, but instead of being chilled and served in a masu, it was served warm and in a pottery cup. 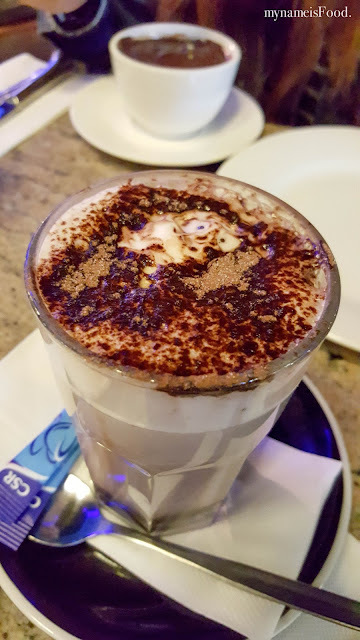 Serving it warm definitely does affect its taste as it was smoother than it was served chilled. Having a warm sake allows you to enjoy the main meals much more than a chilled sake. Though still retaining its bitterness, its smoothness increases. 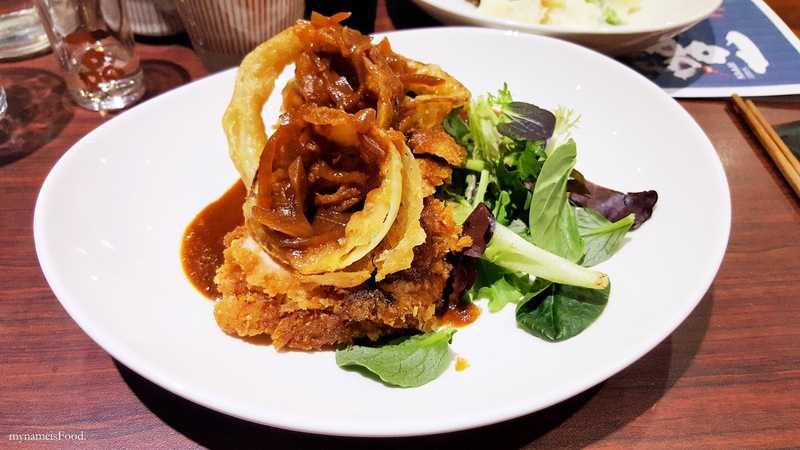 'Japanese Style Pork Cutlet' was a mouthful to eat and even to look at, topped with crispy onion rings and a gravy based sauce with onions served with fresh salad greens at the side. Nicely plated on a curved plate allowed the dish to be elaborated by its own elements. The gravy based sauce was poured over the crispy onion rings and the pork cutlet and although it did make a part of the onion rings soggy, it did enhance the texture and flavour of the pork cutlet. 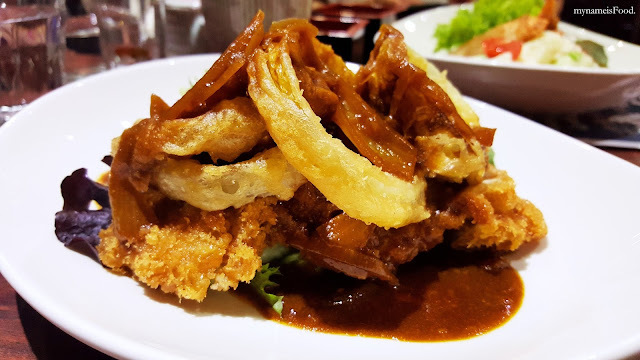 The pork cutlet was cooked well with a light crumb exterior, slicing through the pork meat and dipping it into the gravy based sauce was a delight to eat. The salad greens mix was quite dry but when eaten together with the pork cutlet, it tones down the strong flavour of the sauce. I did feel that maybe the sauce could've been poured over the salad greens too instead of it being fully dry. 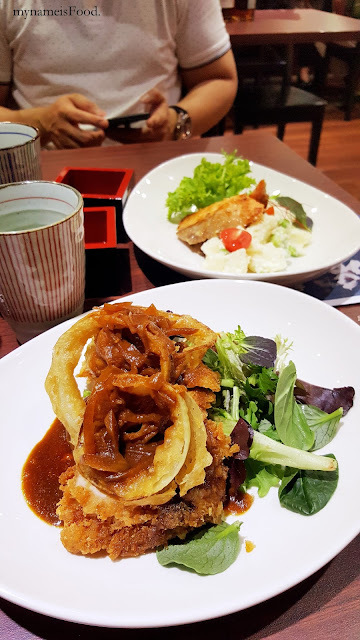 The crispy onion rings were lightly battered and being able to see actual thin slices of onion ring made me have a smile on my face. It is always such a bother when seeing onion rings being made with full batter and only a little onion. 'Great Tasmanian Salmon with Saikyo-Miso' was served with roughly chopped mash potatoes with Edamame beans and fresh salad greens on the side. The cherry tomato did give it a nice pop of colour to the dish. Oh, and also some saffron which was another nice touch. To be honest, for a Degustation night, I did not expect the portion of the mains to be this much. The Tasmanian Salmon was grilled to perfection I do have to admit. The smoky flavour and the grilling marks scored points for me as sometimes some grilled dishes don't necessarily show the grill marks or even any hint of smokiness whatsoever. Being not sure what the sauce base was but from what we tasted, it seemed to have been a soy sauce based with a hint of saffron but also a tad salty. 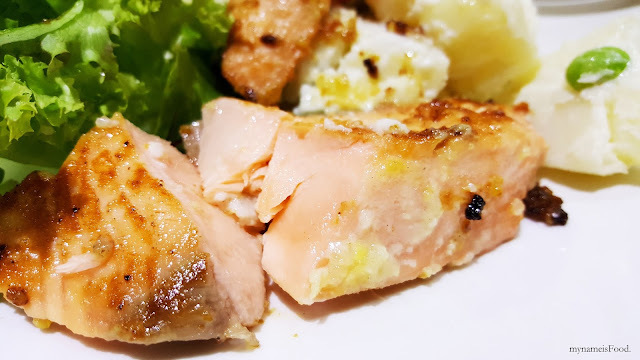 Overall, the marination was done well as the salmon has absorbed it all allowing you to taste it with every bite without having to pour further sauce as you would probably with your seafood or steak when sometimes, they just haven't done enough marination for your meats or seafood. 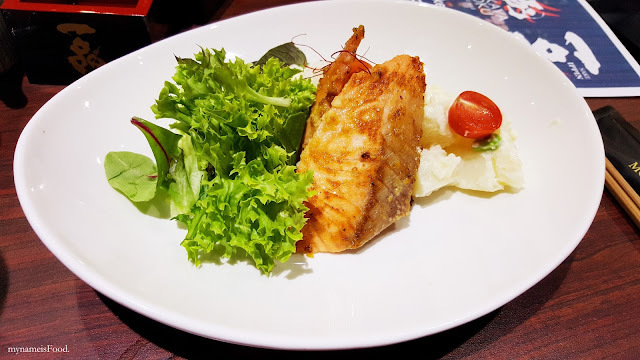 The choppy mash potatoes was quite cold but added a touch of freshness along with the salad greens. 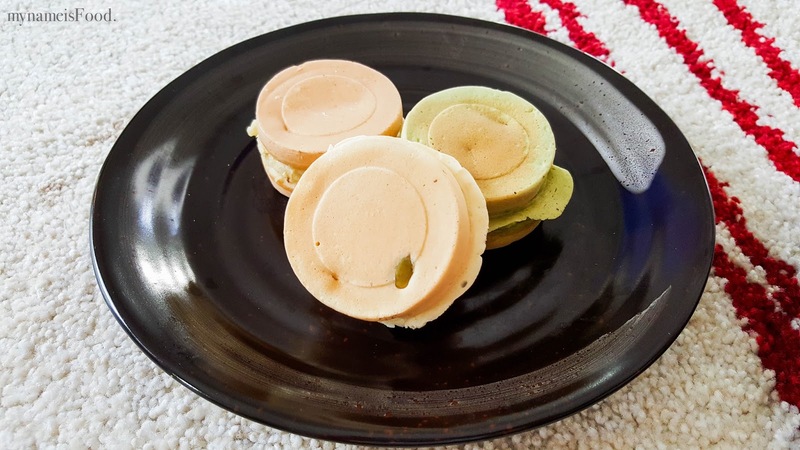 Edamame beans was mixed into it which blend in nicely together and would have been great to even eat it by itself. 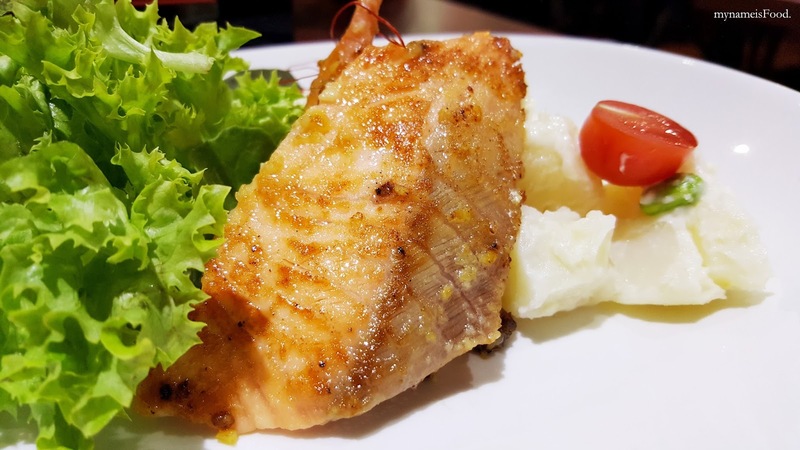 It was subtle and did not have a strong dressing which allows the juices from the salmon and the sauce to soak in slowly when you smear it. Ippin Dancing Rabbit was the final sake to be served and was the only cloudy sake out of all of the ones served throughout the whole night. It was intentionally brewed by not using any pasteurised paper but was able to have that slightly white colour..
'Green Tea and Strawberry Rice Cake' with Berry compote and Plum Wine Sorbet. 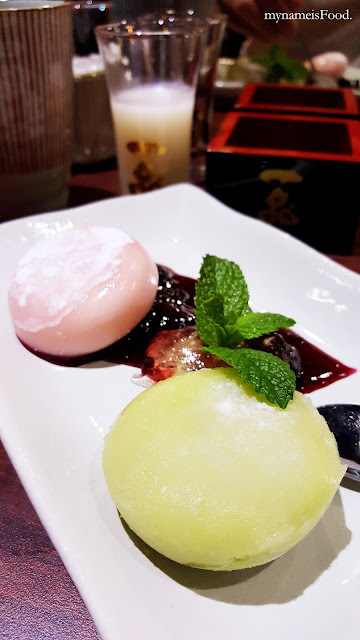 Having tried so many different Mochi and other similar desserts in Japan from my Japan trip, I was quite excited being able to eat it again. 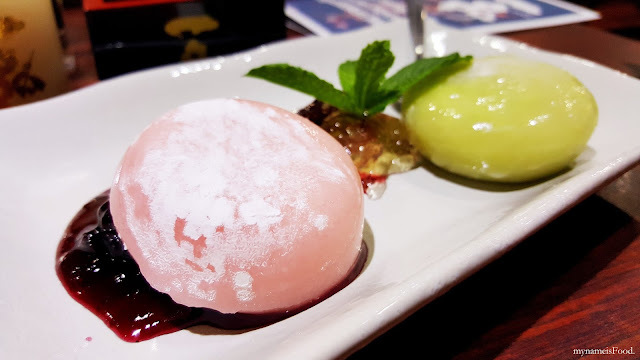 Styled elegantly, two medium size ice cream filled mochi dusted with icing sugar was the dessert of the night. The rice cake seemed to have been frozen since they were stone cold but not even a few minutes as soon it arrived on our table, it became not as freezing cold as it was before. We were quite worried if it would have been hard to even fork into it. 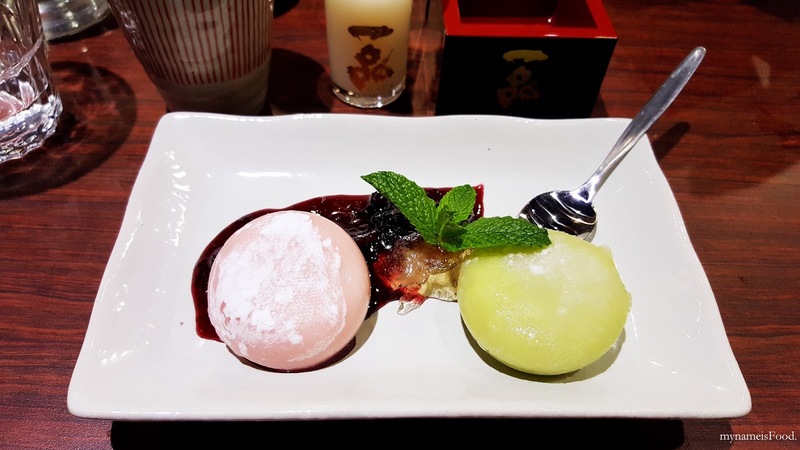 The berry compote and the plum wine sorbet surprisingly complemented both flavoured mochi well. The berry compote was not sweet and still had that bitterness but what I liked best was the plum wine sorbet. Sadly there was only a little spoonful of it topped with a bit of mint leaves. 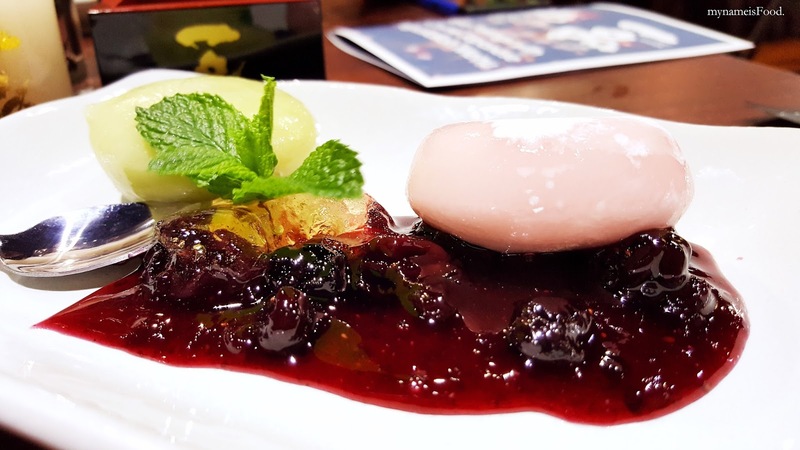 If you're not a big fan of strong green tea, then eat it with the berry compote and it would lessen the green tea flavour. 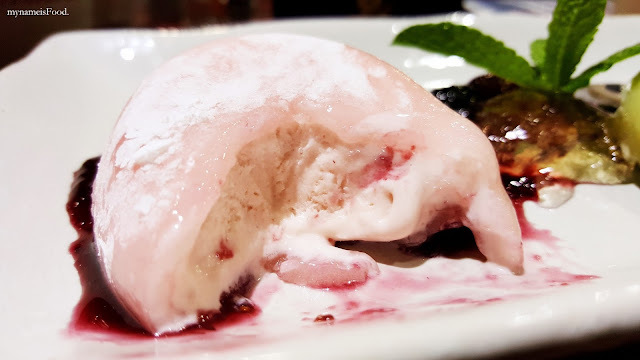 The plum wine sorbet may not be everyone's favourite but if you like your plums or your wines, I'm sure you will love this too, it was sweet and refreshing. However, it was a very pleasant and lovely dessert to end the night. *mynameisFood. was invited to dine as a guest of Izakaya Goku for the Degustation, as always, opinions are my own.